Dimensions: 7.25" L x 6.5" W x 2.5" H; Wood Box with gold latch and hinges. 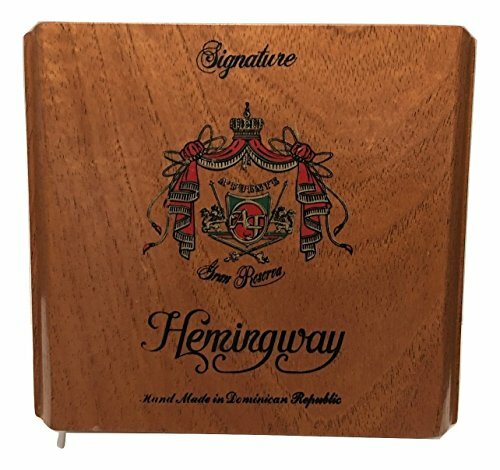 These durable strength wooden cigar boxes are ideal for storing valuable items as an unsecured storage box or keeping your cigars neat and clean. Perfect for those musicians who use wood boxes to build new guitars and ukulele's or use them to break apart and repair ones you already have. These boxes were used to ship cigars to retail outlets; Many times they are put in a walk in humidor where customers open and close the box numerous times before it is emptied; Boxes may have some small dings or scratches from being handled and stored. Each are chosen to ensure the best conditions are sent; Some of the boxes are wooden with paper covering (as shown in pictures). There are no cigars provided with this purchase, only an empty cigar box. 1. One of the best things to use a cigar box for is making Guitars and Ukulele's. You can also use them to make fairly inexpensive speakers that will both look and sound impressive. 2. Stylish storage for remote controls. Rather than having remotes laying all over the room, now they reside in a cigar box. 3. Store your office items such as stationary, pens, pencils, post it notes and even business cards. 4. Use it as a monitor stand, shelving or chest of drawers. Check out Pinterest for innovating ideas. 5. Pet treats can easily fit within a cigar box and are easy to get to, so make sure your pet's can't reach it! 6. Why not give a gift that is wrapped within a cigar box. It's turns out to be two gifts in one! Each are chosen to ensure the best conditions are sent; Some of the boxes are wooden with paper covering (as shown in pictures). There are no cigars provided with this purchase, only an empty cigar box. If you have any questions about this product by A Fuente, contact us by completing and submitting the form below. If you are looking for a specif part number, please include it with your message.